The report below by Egri Nök was published earlier at Vlad Tepes in a slightly different form. An original translation from Jüdische Allgemeine, the largest German-language Jewish publication online and offline. Not long ago there was a report in a local Bochum radio station that went widely unnoted, but it was an alarming signal. According to the report, the Bochum Jewish Community advises their members from now on not to wear the kippah or other Jewish symbols in public. The reason: there have been repeated attacks in the past, when community members were identifiable as Jews on the street. In particular, Turkish and Arab migrants are responsible for the attacks, the community announces. Reality in other German cities is not different from Bochum. In Berlin it has long been daily life for Jews, from Neukölln through Kreuzberg to Wedding, not to wear Jewish symbols in public. The same can be heard from many Jewish communities, from Kiel to Konstanz. For non-Jewish Germans the anti-Semitic excesses of Muslim migrants might come as a surprise. For the Jewish community they are part of life. CLARITY. It is all the more important to point out in all clarity and without prohibitions of speech: the Muslim community has an enormous problem with anti-Semitism in their own ranks. The hatred for Israel, the abhorrence of everything Jewish, is not seen as anything offensive by many Arabs and Turks in Germany. But when the desecration of Israeli flags by the anti-Semitic mob in Berlin in front of everyone’s eyes goes unpunished, along with cheers for the massacre of a Jewish tribe that Mohammed’s army once committed, then this is highly dangerous. Contrary to what has happened, the police should intervene immediately and with all toughness. The only answer should be: a strong rule of law, consequent intervention, a clear naming of the problem, and more than just trite “Never again!” phrases. When politicians such as Sigmar Gabriel demand “zero tolerance” in their Sunday speeches concerning such excesses, but on all other days of the week tolerate the hate, then something has gone very wrong in Bochum, Berlin and in many other German cities, where aggressive Muslims try to make Jewish life impossible. This entry was posted in Civil Liberties, Counterjihad, Domestic terrorism, Enrichment, Europe, Immigration, News, PC/MC, Politics by Baron Bodissey. Bookmark the permalink. Thanks to Merkel Her Government and this dangerous insane policies, she invited all this Muslim horders, THEY NOT REFUGEES! !, how long to take to this stupid politicians heads ..
She hates jews, just like a stasi. “tolerance” for the Muslim barbarians. It’s a diabolical plan & God is watching. He sees it all. She can’t fool him & Germany will suffer for it again. Should never have torn down the wall; this is the result. The German leaders just can’t help themselves. Merkel is pushing for E. Europe to take in invaders, bullying Poland, etc. Soon all of the E.U. will be under sharia law with little or no resistance from the masses. Descent into a third world, executions of infidels and slavery will result. What about Ursula Haverbeck in prison for denying the [Holocaust] ? Is that democratic denying freedom of speech ? Now you got the Muslim and that’s Merkel’s problem , she is a Hypocrite . There are laws in Germany that make it a crime to deny the Holocaust. She broke that law many times! She’s paying the price for that crime but is unrepentant. Germany is NOT the USA. They have different laws. The fact is though try telling the survivors of the holocaust that it didn’t happen. They are still alive. Merkel is a hypocrite though. She uphold that law with one hand but brings in a new holocaust with the other. Jews, in the end, will have to acknowledge God and his Son, repent, and be saved. Conversion is fine but the followers of Mohamet want to kill all the Christians too. And the Hindus, Buddhists, Sikhs, Jain, countless others and all atheists as well. I am not talking about conversion. Israel is supposed to be the chosen nation, and God of the Bible has plans for them. Israel rejected the Old Covenant, not the New. Being a Jew has nothing to do with Israelite descent. Barn Swallow, I’m not a believer in any God (though I’d like to be), but if your version of God only admits Christians to salvation I’ll take my chances in Hell; at least you won’t be there. Why do you assume anything about “my version of God admitting only Christians to heaven”? You say “Jews, in the end, will have to acknowledge God and his Son, repent, and be saved”. This implies that they are not saved if they don’t do so. There is nothing “implied” in that statement, Mark. It is an assertion; the kind of statement that is the obverse of aggressive atheists who claim that believers are stupid and doomed for their credulity. Both sides could use a bit more discernment about where they choose to preach their dogma. Usually, I don’t let these comments in since they don’t meet GoV’s guidelines for civil and courteous dialogue. Jews don’t need repentance, they need to get outta France. Europe is historically anti-semitic; it’s why MC left England and he is just one of the thousands of Europeans to do so. Mark H – I don’t dare to judge who is saved and who is not. In my view of things, Israel is a pretty important part of the whole history, and given the history: Israel gets saved from Egypt – but then they abandon their God and are punished for it, and then there is a revival… It’s all throughout the Bible, not just once, and I simply assume that this show is not finished, and that we will see at least one more round. And I don’t see it simply from the biblical point of view: Imagine the West hits a great economic crash, and EU/USA is no longer able to support Israel. What do you think will happen? I see quite clearly that all the islamic nations will try to fulfill their words and attack Israel… Then there will be times of trouble like there newer was before. And, being a Christian as I am, this final time of trouble will end by Israel being saved. It was a statement of fact – nevertheless I know that in the Jewish community there is and will be strong opposition against Jesus Christ as their King. I assume this will have to change before Israel is saved from this war. Granted you don’t have to believe or agree with what I am saying, but I don’t say it in order to argue or fight. I say it because I always say what’s on my mind. And I don’t mean any offence. I would never go and attack for example Bob below for saying Jesus is an Idol – although I disagree with him – I am perfectly fine with him saying that. Honesty is one thing I value, for without honest discussion we might never arrive to the truth. No, Barn Swallow, they won’t have to do as you say. Jesus stayed a Jew all the way through. Isn’t the world divided enough without these kinds of unprovable assertions? Saying such things simply sets people’s teeth on edge. If anyone is upset by me saying that Israel will be attacked, only to discover that Jesus Christ is the Messiah all along, then you must have some trigger issues, for I’m just commenting on what I red in the Bible. I can’t believe what I’m reading here. The jewish people have it right. There is only one God and that is the God of Abraham, Isaac, and Jacob. Please read Isaiah 45:21-22. 45:5-6. 43:25. 43:10-13.What don’t you get about these verses.If you want to know who is son is please read Exodus 4:22-23. jesus is an Idol of the pagan religion called christianity.Stay away from the new testament which is totally tampered with by the king james boys and get a jewish Tanach (stone edition) which is still in the original text. And do yourself a big favour. Shut off the T.V and search, research and study. research . yes. judah , is just one of the 12 tribes of Israel . Find the others. jesus and james knew where they were 2000 years ago. Jesus gave the apostles a specific charge. This is your quest. Religious faith is not something that can be taught in a comment section on a website here in the ether. There seem to be a number of hot-button topics that set people off. Religion is one, Russia is another, abortion another, and always & ever the JOOOS. My mistake was letting that original comments skew this thread. Sons of God are quite prominent all throughout the Bible. Christianity offers man a chance to become a son of God through Jesus Christ, who – according to my belief – is the first born. In our timeline he was born later, neverhteless the divine realm is outside of our time, and therefore Jesus was known to God even before he was born. Just like many other people. Barn Swallow, after reading your comments it’s clear that [you have an antipathy towards the Jews]. וַאֲבָרֲכָה מְבָרְכֶיךָ וּמְקַלֶּלְךָ אָאֹר וְנִבְרְכוּ בְךָ כֹּל מִשְׁפְּחֹת הָאֲדָמָה׃ Bereshit (Genesis) 12:3. Answer this for me, if the Jews are a cursed people then why does the adversary/enemy (hasatan) still spend so much time & effort persecuting the Jews to this day? We know from Scripture that he persecutes those who are blessed! Not those who are cursed! He’s not concerned with those who are cursed, he’s accomplished his work with them. You are confusing the enemy’s persecution with Divine cursing. This is very dangerous! Repent! Hi, to be honest I have no clue as to why would you think I have some kind of antipathy against the Jews? Nevertheless, as a Christian I do see some unfinished business in the divine realm to be played out. Can you imagine a scenario in which Jesus Christ is really the king of the Jews? I’m not preaching, I’m just explaining myself, but – if Christ is the King then Israel today doesn’t really follow her King – and that will lead into a lot of trouble. I say it as I see it. Divine curse in case of Israel is when God leaves Israel alone and they (you) have to deal with the world on your own. That is the curse. Quarrels of this sort among natural allies troubles me. I figure maybe I can tell a story to help close the topic or at least restore good humour. An atheist was walking through the woods enjoying the beauties of nature. Suddenly he heard a rustling in the bushes behind him. He turned to look and saw a seven foot tall grizzly bear charging towards him. He ran as fast as he could, looked over his shoulder and saw that the bear was gaining on him. Then he tripped, fell, rolled over and saw the bear over him about to strike. OH MY GOD! He screamed. Time stopped, the bear froze, the forest was silent, a bright light shone upon the man and a voice came out of the sky..
You deny my existance for all these years, and you expect me to help you now? Am I to count you as a believer? The atheist, a quick witted fellow, said that that would be hypocritical of him…but perhaps you could make the bear a Christian? A pause, “very well” said the voice.. The light went out, the sounds of the forest resumed.. I have, of course, stolen this story from our abundant culture. “the police should intervene immediately and with all toughness.” yeah right ! ! that is serve and protect the state ! The police have no duty to protect you. They are there to enforce the law.for the government. And we all know the government’s priorities. The cure in San Francisco in 1856 was amazing ! ! That wasn’t the actual ruling. The ruling was, the police force was not subject to damages because a criminal committed a criminal act. The Constitution provides certain restrictions on government, like the forbidding of regulating free speech. If the government violates this by government action, it can be sued. The ruling was, the police cannot be sued for the occurrence of a criminal action. Presumably, the voting aspect of government regulates the performance or non-performance of government functions, but a poorly-functioning government cannot be sued, but must be voted out of office. Here in Southern Israel we have had nearly twenty missiles fired at us this last few weeks, each one a war crime! but each one is ignored by the international community who are much more interested the non-issue of Israel’s capital. When are we going to learn the stark fact, Islam is a political entity at war with the rest of the world, an entity that especially hates Jews wherever they are, and that never makes ‘peace’ as such, only takes a pause in actual fighting. That Europe is beginning to live the Israeli experience is the shameful result of the naive thinking of emotional ‘socialism’ and its unholy relationship with terrorism. It is a law of the universe, that one shall reap what he has sown. Therefore, the actions of the western leaders might seem crazy at times, but maybe they are just a part of divine justice, like when the LORD hardened the heart of the Pharaoh. For ‘we’ know Islam for what it is, but leaders of the EU might fulfill the saying: None so blind like those who have eyes but refuse to see. The refusal to see is in fact refusal to admitting one’s own mistakes and sins. Pride is an abomination. Barn swallow wants people punished for their corrupt leaders actions. Any public support generated for those nato actions was generated by deceipt and manipulating emotions by leadership and media. It’s worse than you’re saying, MC. A few front-line countries among which Israel figures most prominently, specifically in places like Sderot, are holding the fort for the rest of the world. If the Islamists weren’t so focussed on Israel, then JUST IN EUROPE they’d be looking to retake Spain and finish the conquest of Cyprus, all the while while winning the demographic battles elsewhere. And the “international community” would largely ignore it, with the usual “I’m all right, Jack” attitude that it has. Israel is one of the very few places where Islamists are getting serious “Not beyond here” pushback. China and the Philippines (under Duterte) are other examples. I will point out that both of these places are doing so in ways that show MUCH less respect to individual rights than Israel does. Israel has somehow managed to keep this fight going WITHOUT widespread and common gross individual rights violations, and that is unique. Indeed, for a challenge, one can name 20 stable, independent democracies that have been so continuously longer than Israel. It can be done. Then try to name 25, and find out that one has to include places like Colombia, Austria under allied occupation, etc. in order to get to 25. You live in a unique country, MC. “Emotional Socialism” – useful term. In psychology emotion beats logic every time,now we understand a little more about the loony left. Indeed, Unfortunately “Welcome Refugees” has won the day …. and shall continue to do so until there are no more left to ‘welcome’ them!! Europe’s (and America’s) Jews should have a word with the organizations that claim to represent them, because to the best of my knowledge all of those organizations support Muslim immigration and oppose white European resistance to it. She said this in a statement released late Sunday night after preliminary results emerged showing that the controversial party had received more than 13% of the vote – causing widespread concern across the Jewish world. The country’s Jewish community is now taking a firm position against the far-right National Front party candidate for France’s next president. As a Jew, I’m also quite concerned about AfD getting 13% of the vote. I wish it were 63% of the vote. Then I wouldn’t be concerned. At 13%, I feel that there may not be hope to save Germany. It’s not even that I care that much about Germans (though I have nothing against them at present). 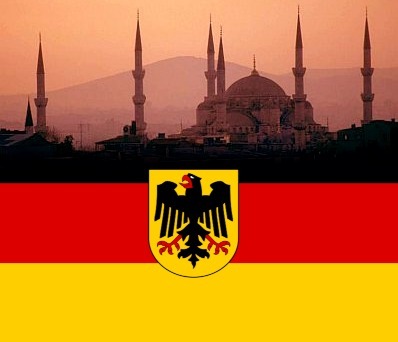 It’s mostly that an Islamic Germany will be “bad for the Jews”. So bad, in fact, that I’d say that the bigger long-term threats to Jews and Israel nowadays might not even be in the Middle East. To be fair though, Mr. Schuster, the current chairman of the ZDJ, Council of the Jews in Germany, has been repeatedly warning of the consequences of Muslim immigration. Israel is the home of God’s Choosen People ! We must never forget, and never allow persecution to thrive again ! Tell that to Leftist Jews – they don’t read GoV. I’m sorry, but I have very little sympathy for the German Jews. They seem to have exactly the same political profile as US Jews: support immigration, especially Muslim immigration, oppose any measures to specifically target Muslims, and oppose any parties, such as the AfD which support Israel and oppose immigration. Further, I oppose the US admitting these Jews. We do not need to import any demographic voting overwhelmingly leftist and in favor of immigration. Most German Jews repudiate the AfD as anti-Semitic, pointing to its anti-immigration and anti-Muslim platform and arguing that whoever targets Muslims and other minorities will sooner or later seek to harm the Jews’ religious freedoms. Indeed. The Jewish population in most Western countries is a microcosm of the “white” population, but in a more extreme way. Irretrievable leftist voters, voting to bring about their own demise. Jews in France seem to have figured out more than most where their behaviour is taking them, but there are still plenty of leftists there, too. It’s the phenomenon of the self-hating Jew, and is sadly very common. MUCH less so among religious ones, though. Agreed.The secular Jews and those from the Reform version of religious practice are mostly leftists. The Conservative version leans more toward reality, while Orthodox Jews stare it in the face. This is pretty much my analysis as well. Although I’m secular myself, I’m left with no choice but to agree with the religious on the matter of Reform Judaism being a false path – just for different reasons. I find the ultra-orthodox to be an interesting subspecies, running from hard-left anti-Zionist (the Neturei Karta that show up to support Hezbollah and the PLO) all the way to Hardal fascists somewhat reminescent of Islamists, with a majority that are politically pragmatic in between. Many of them seem not to be extreme in anything other than their own religious practices, which I always find surprising. I bet you angela merkel is happy. I find this issue quite confusing as Sweden’s current situation can be attributed in great part to David Schwarz, a Polish born Jew who emigrated to Sweden in 1964 and set about altering the face of this once very homogeneous Country. It was due to his aggressive pursuit of diversity that Sweden become a “multicultural country” that the following bill was initiated; (1975:26) on guidelines for immigrant and minority policy which was adopted by a totally unanimous Swedish Parliament in 1975. You also have the likes of the Jewish Barbara Lerner Spectre, who has dictated to Sweden and Europe that WE WILL become a multicultural continent ; “I think there is a resurgence of anti-Semitism because at this point in time Europe has not yet learned how to be multicultural. And I think we are going to be part of the throes of that transformation, which must take place. Europe is not going to be the monolithic societies they once were in the last century. Jews are going to be at the centre of that. It’s a huge transformation for Europe to make. They are now going into a multicultural mode and Jews will be resented because of our leading role. But without that leading role and without that transformation, Europe will not survive”. – How on earth can people likes these, who are not even Swedish, spearhead these kinds of campaigns that are literally ruining a whole continent? Hitler was a practice run with a leader ran amuck. The globalists lost control of him. He was a prelude to the Biblical Antichrist who is a alive and will be on the world seen soon. He will take power not by his own accord but when 3 nations fall the little horn will rise up and blaspheme against the Most High and His anointed. Thus during Tribulations those who don’t take his mark and worship him and reject Christ will be beheaded. The AntiChrist is a Muslim. The prophets of Baal whom the Prophet Elijah battled against were ancient muslims. Baal is Allah They have the same crescent moon symbol. They are the seeds of the serpent the sons of Lucifer. The sons of darkness. Albert Pike wrote in the 1800s why we would have 3 world wars and the globalists/ Illuminati/ Bankers are following it to a T. The UN and EU want global disarmament 22/Agenda 21. All the war in blood shed of the muslims fighting the Christians and Jews they hope will justify UN occupation and Martial Law. Thus gun confiscation. It’s been their goal all along. I follow a Messianic Jew in Israel named Jerry Golden who has been saying for a long time that soon Jews in Europe will be running for their lives again, and has purchased boats to rescue them when the airports are shut down. I sent a donation and his website is thegoldenreport.com. We all know this means WAR is coming. Get ready world. Trouble comes in […] like gangbusters. It is not just the Jews that will flee. So will the OTHER tribes of Israel, and so do all other religions from the Is lamb. Keep in mind the Judah is only one of the 12 tribes. \And what of the ishmaelites. You have ignored the Bible at your own peril for too long. Where are the other israeli tribes . Jesus told you if you were paying attention as the apostles were. Brett, didn’t some of the tribes disappear about 2,500 years ago? What have they to do with is going on in France in 2027? Am American religion, the Mormons believe the lost tribes migrated to America and became the American Indians. Some English people used to believe the lost tribes migrated to Britain. They brought with them the very stone Abraham wanted to sacrifice his son on. Some say angels carried it through the sky. Some say it flew through the sky all by itself. Whoever runs this site should be embarrassed. It’s ludicrous. It appears to me that this site is censored. Moderating is the goofball’s word for CENSORSHIP, as in communist Russia and communist China. Now we have communist America. Neither of my replies have been posted. I’m done. Off to the recycle bin with this website. click. The site appears to be a forum for people devoted to the Jewish part of the Bible. They endlessly quibble about when the word Jew first appears and the lost tribes and whatever happened 4 to 2,000 years ago to one tribe of middle eastern nomads who ended up in and around Jerusalem. This is the end of 2017 and Muslims are invading Europe. And the comments are all about bible quotes. I don’t care about the moderators. If I wanted to go to a bible discussion website I would go to one. But I thought I was trading a website about the Muslim invasion of Europe. Gates of Vienna is a bible discussion site. I stand with Israel and the Jewish people,I advise either move to Israel or Tasmania/Australia.We have the oldest Synagogue in the southern Hemisphere in Hobart and second eldest in Launceston.Very few racists to worry about. Thank you for commenting! Tasmania no less! I looked up information on the area because it seemed so exotic. And it is. The added information you provide proves it, i.e., the “oldest synagogue in the southern hemisphere. Do you also have a Muslim immigrant population? It would seem the ones Australia deems too mentally ill to be allowed into the country are now to be shuffled off to America. Someone in the thread mentioned the discord in this thread amongst those who should be allies, I’m assuming he meant of,like mindedness in recognizing the enemy and broad strokes solutions (stop the endless immigration of those whose goals conflict with ours.) all that to say: the enemy loves to see discord amongst believers. You can extend that to any group. What happens when a community bickers about every point? What happens when non believers, Christians, Jews, etc…. with similar moral outlooks attack each other? I’ll say that most of the religious conflict in these comments are out of ignorance of the word, or just not accepting the spirit of God and his intent for his people, aka Israel -which, if I have to say it, is all of us believers, not geographically limited to the country of Israel. God has a plan, a written plan. Jews and Gentiles are part of it. Amazing. You are so inside the inner workings of God that you know he writes. Perhaps by now, he uses a keyboard and this plan is already in the cloud. Yep, sounds like a plan…you forgot the Buddhists, Hindus, animists, etc. All created by God…and God wears many faces. I hate these threads when they get skewed by religion. This is a report about what is going on in France and what the Jews will or will not do in response to the danger they face. It is not, was never, a theological report. Next time we have to report on anti-semitism, any theological comments will be deleted forthwith.